It’s good, but not great, news for snow leopards. New population assessments of the big cats shake their 45-year-old status as endangered. The number of these majestic creatures is moving in the right direction. Yet, conservationists warn not to become complacent in the movement to protect the species. These cats are well adapted for their cold habitats with a long, thick fur which varies in color by the season. In the summer, their leopard spots appear, allowing them to blend in with the rocky terrain. Their tails are amongst the longest in the cat family. It measures from 31 to 39 inches long and acts as a blanket in harsh winter conditions. These delightful characteristics make it an important symbol to communities in the region and a charming species to protect. The good news for the snow leopard came in the 2017 assessment of species at risk. New population data collected in 2016 indicated the population numbers have increased over the Endangered threshold into the Vulnerable category. The International Union for the Conservation of Nature, or IUCN, releases its Red List of Threatened Species with major changes in their assessment of species vulnerability. This List is the world’s most comprehensive and objective approach for evaluating the conservation status of animals and plants. Their rankings influence the policy and work of governments, institutions, and NGOs. The ranking system ranges from Extinct to Least Concern, with additional two unknown categories of data deficient and not evaluated. For known species, there are three categories of concern: Critically Endangered, Endangered and Vulnerable. 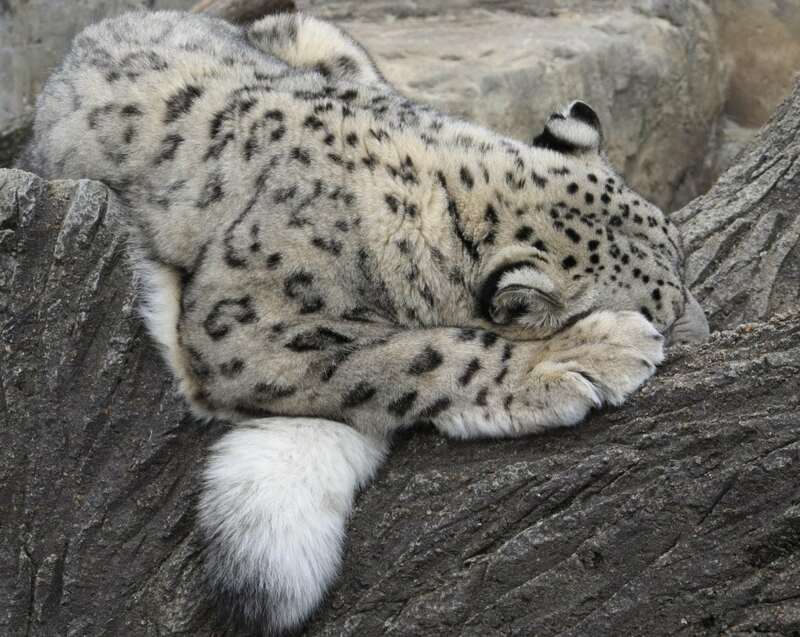 Since it was first listed, the Snow Leopard has stood in the Endangered category. Specifically, Endangered species have fewer than 2,500 mature, breeding individuals, as well as have experienced a decline of 20% in the global population over two generations. The most recent population assessment covered one-third of the likely species habitat and estimates the number of mature individuals to be between 2,710 and 3,386. These numbers push the Snow Leopard to Vulnerable status. Vulnerable is defined as populations between 2,500 and 10,000, and with a population decline of 10% over two generations. This is good news for the snow leopards. The species is declining at a slower rate than previously thought. The conservation efforts made throughout their habitat is providing promising results. Some conservation groups call for the revised status is to be reviewed with caution. Although the decline is slowing, scientists warm that the cats still face a high risk of extinction in the wild. We believe the best available science does not justify the status change, and that it could have serious consequences for the species. Their concern lies in the limits of the habitat range being sampled and the bias towards areas with a high-density of snow leopards. After all, it’s not easy to count one of the world’s most elusive creatures. Scientists are split as to how to best estimate the populations. Some reason that estimates outside of standard species counts need to be made based on the difficult terrain and cryptic patterns. Others state that estimates and targeted surveys show false increases as populations are not being counted using scientifically standard techniques. Conservation groups are concerned that the down-listing of the cat status will lower the priority of conservation work. Groups are concerned that this momentum will be lost. The new ranking may make efforts and funds harder to justify politically. The threats to snow leopards are many. These cats face habitat degradation which removes territory, often for livestock. Overhunting also reduces the natural mountain prey. There is a significant impact by local herders who kill the snow leopards that prey on their animals. Poaching for illegal trade is also common. Their fur is unique and so pelts and taxidermy are in demand on the black market, especially in China and Eastern Europe. Their bones are used in traditional medicines. Mining expansion is a new impact on the mountain ecosystem. And climate change is warming the Tibetan plateau, an important habitat range of the snow leopard. The 3-degree increase in ecosystem temperature impacts all aspects of the cats’ survival. As noted, there has been a recent international effort to coordinate snow leopard protection. The Global Snow Leopard & Ecosystem Protection Program (GSLEP) is a joint effort begun in 2013 to conserve the animal and its ecosystem. pledge to ensure that snow leopards and the people who live among them thrive in healthy ecosystems that contribute to the prosperity and well-being of our countries and the plane. The current target of GSLEP is to protect and secure at least 20 healthy populations by 2020. The group is also developing best practices and a toolkit for management planning. In August, an international forum took place in the Kyrgyz Republic in the on-going effort to build the joint protection response. The revised status of the snow leopard is showing a positive movement in their population health. Their population has stabilized in some areas and is potentially increasing. This majestic creature is in a healthier position than it has been over the past 45 years. However, the listing as Vulnerable still lies within the Red List’s threatened categories. While no longer endangered, the parameters of a Vulnerable species are still marked by decline. Given the difficulty to track and their threatened status, conservationists call for more study and continued protection efforts. Previous Post« Previous Can Childhood Experiences Alter Your DNA and Make You Prone to Illness?